Nick Isaac, barrister, of Tanfield Chambers in London, is a barrister with over 20 years' experience in property law. He is widely recognised as a leading expert in party wall matters, appears regularly in court in party wall appeals and injunction applications, and advises solicitors, surveyors and lay clients alike. He has also appeared in two of the very few party wall cases heard in the Court of Appeal. 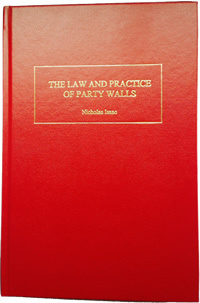 Nick also regularly lectures on party wall issues to solicitors and surveyors, including to the Pyramus and Thisbe club - a club primarily for party wall surveyors - and the Faculty of Party Wall Surveyors.